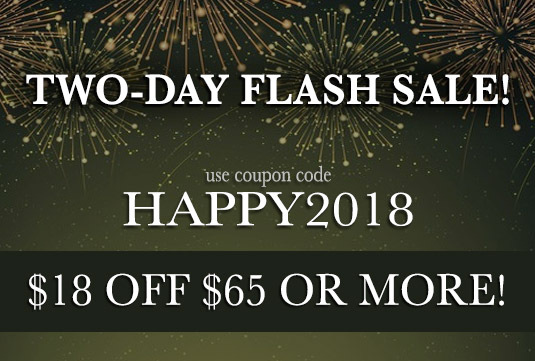 Home / News / New Year Flash Sale HAPPY2018 Coupon! See post for details! NEW YEAR’S FLASH SALE FOR TWO DAYS ONLY! Celebrate the start of 2018 with our site-wide coupon code: HAPPY2018 and you can save $18 off purchases of $65 or more! This is only a two-day flash sale, so be sure to get your order in before it expires at 11:59 PM PST Monday, 1/1/2018. This site-wide offer includes all of our official Star Wars™ furniture, art and decor where you can add a little geek style into your home, office or fan cave decor. And be sure to check out our “More Decor” section where you can find classic monster-inspired decor and 80’s themed furniture! Shipping does not count towards the $65 minimum order total and some standard restrictions apply. The coupon code HAPPY2018 is required and you can see our site’s Payment, Shipping and Returns page for further details about coupons and discounts. Take advantage of this two-day sale! Thank you all for reading! We hope you’ve all had a wonderful holiday season and wish you the best for the new year! Warm regards to you and yours from the artists of Regal Robot!